Independence: How to be responsible for and help themselves. Problem Solving and Decision Making: How to think through their challenges to make mature, responsible decisions. Persistence: How to overcome even the largest obstacles through perseverance and believing in themselves. We believe building these qualities through gymnastics achievement enhances a child’s resiliency and ability to excel in any sport or any situation. In our gymnastics programs, you’ll see children performing at accomplished levels of gymnastics and those performing at fundamental levels. Our emphasis is not on who’s the fastest, the strongest or the best, but on the adventure of growth and learning. We use gymnastics achievement to inspire your child to enjoy learning. Not just in gym class but at home, at school, whether they’re climbing a tree or doing math homework—learning is life’s highest adventure! Here we believe that for a child to embrace physical education as an integral part of their lifestyle, it must be challenging, it must be intriguing and it must be fun! The essential ingredient of “fun” increases a child’s learning retention and makes any learning situation engaging and memorable. This class was designed to focus mainly on sensory processing, development of gross and fine motor skills, setting the foundation for coordination and strength development, and reinforcing the loving bond between parent and child. It is a 30 min. Annual registration must be paid but Caterpillars is a tuition free class. Using equipment and circuits designed specifically for little ones, this class works on gross motor skills in a playful, socially enriched gymnastics environment. Classes are based on progressive lesson plans and learning objectives are met through repetition, encouragement and recognition. This class introduces children to the dynamic sport of gymnastics. We channel all that energy into an organized, structured program featuring the tumble floor, beam, trampoline, bars, and vault. While they are learning gymnastics, they are also learning about counting, colors, ratios, proportions, consequences, music, cooperation and much more! Bouncing Bears are coed gymnastics classes for 3 year old children. While participating in class, children learn fundamental movement, basic tumbling, develop balance, social and listening skills, hand and eye coordination, and large motor skill development in a fun inviting environment. 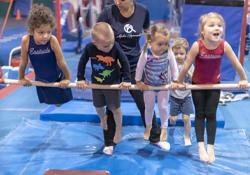 Leaping Lions is a gymnastics class where children will begin learning fundamental tumbling, swinging and supports on bars, balance skills, simple motor skills, listening and social skills, and basic shapes for gymnastics. Children will develop confidence while improving strength and flexibility. In class preschoolers work on skill building equipment and circuits that enhance learning and discovery in an engaging atmosphere that is safe and fun. The Twirling Tigers program is a transition class for young girls from our preschool program. Girls begin to put together more complex skills through learning basic body positons and shapes. Students will develop coordination and strength on all four Olympic events including vault, bars, beam, and floor. Class also includes instruction on tumble track and trampoline in a fun atmosphere with age appropriate drills and circuits to enhance skill development and interest. There are three levels for students to pass off during the kindergarten year. 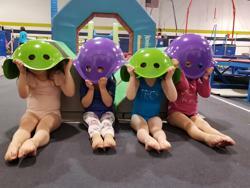 The girls basic class is for the novice beginner who has no gymnastics experience. Students will learn body positions, shapes, safety skills, and develop strength and coordination to develop a solid foundation to progress. Coaches will use skill building equipment and circuits on each event to progress in a positive environment. This class is for those girls who have some gymnastics experience and have already mastered basic skills on each of the 4 women's events, vault, bars, beam, and floor. Students will also learn how to combine simple skills and combinations to put together in a sequence. Class curriculum also includes instruction on trampoline and tumble track. Girls registering in advanced should have mastered the level 2 skills on each gymnastics apparatus. During the advanced program, girls begin to learn flight skills on floor including back handsprings, Round off back handsprings, front handsprings, aerials, basic flipping, kips and swings on bars, handspring vaults, and beam walkovers and back handsprings. Those girls enrolling in intermediate classes should have mastered the level 1 skills. In the curriculum, girls will begin to learn round-offs and do bridge work on floor, circling skills on bars, and more complex balance on the beam. At each level there is always emphasis on increased strength and flexibility. Although not required it is advised for girls to take two classes per week for better mastery of skills. This class is 1:15 in length. Pouncing Panthers is a basic gymnastics class designed to help the preschooler transition from the preschool program. The class will include an introduction to all the boys events, basic tumbling, and trampoline. Young boys will learn basic gymnastics body positons and shapes and set a foundation for more advanced skills as strength, flexibility, and coordination are developed. This class is built for the beginner to intermediate level gymnast, teaching the basics necessary to acquire new skills on all six gymnastics events: floor exercise, pommel horse, still rings, vault, parallel bars and horizontal bar. 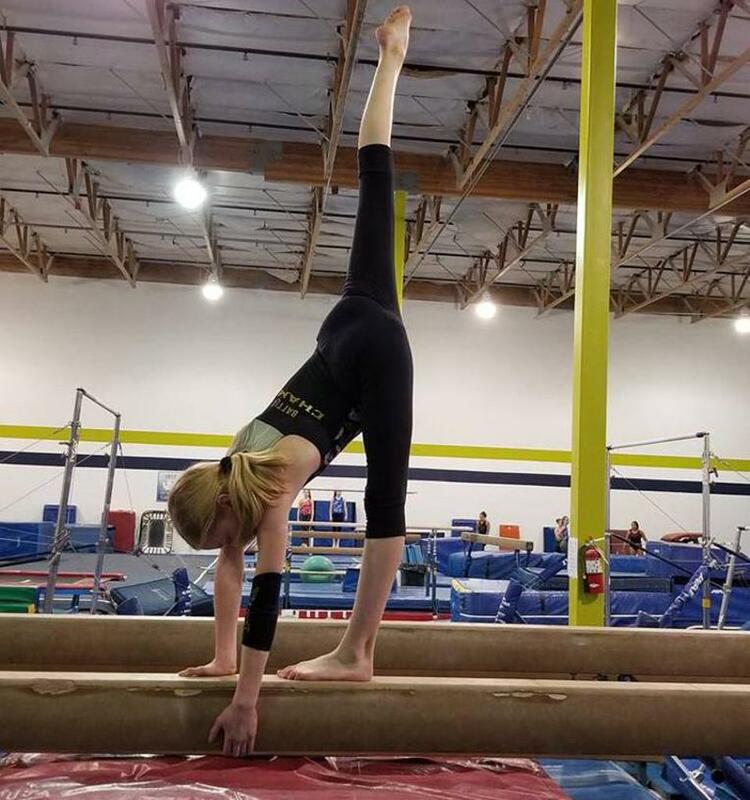 The class allows for children to improve their sense of balance and coordination while developing flexibility and strength necessary to advance in gymnastics. This class is built for the intermediate level gymnast with some experience, geared towards building upon the basics to acquire new skills on all six gymnastics events: floor exercise, pommel horse, still rings, vault, parallel bars and horizontal bar. This class allows for children to develop core-strength and control, as well as flexibility and endurance necessary to progress in gymnastics. Advancement upon coach recommendation only. This class is built for the advanced level gymnast with experience, geared towards building for a more competitive gymnast on all six gymnastics events: floor exercise, pommel horse, still rings, vault, parallel bars and horizontal bar. This class allows for children to develop core-strength and control, as well as flexibility and endurance necessary to progress in gymnastics. To be placed in one of our Pre-Competitive Classes, your child must be evaluated by our coaching staff. Men's Gymnastics is a great builder of strength, agility, and mental focus. The pre-team boys program begins to develop the qualities and physical abilities needed for men's competitive gymnastics. Boys work on developing basic shapes and strength for all of the men's events; Floor, pommels, rings, vault, parallel bars, and horizontal bar. In addition to learning fundamentals and shapes for each event a great deal of emphases is stressed on strength, developing flexibility and responsibility. To be placed in one of our Competitive Classes, your child must be evaluated by our coaching staff. The USA Gymnastics (USAG) Junior Olympic program was developed with the belief that all athletes, regardless of their potential, must have a solid foundation of basic skills in order to advance safely. The program allows the gymnast to advance at her own pace. Alpha Gymnastics has competitive Junior Olympic teams for girls in compulsory levels (Levels 2-5), optional levels (Level 6-10) and TOPS. Our teams compete at USAG sanctioned competitions. Our coaches at Alpha Gymnastics are extremely experienced and knowledgeable. 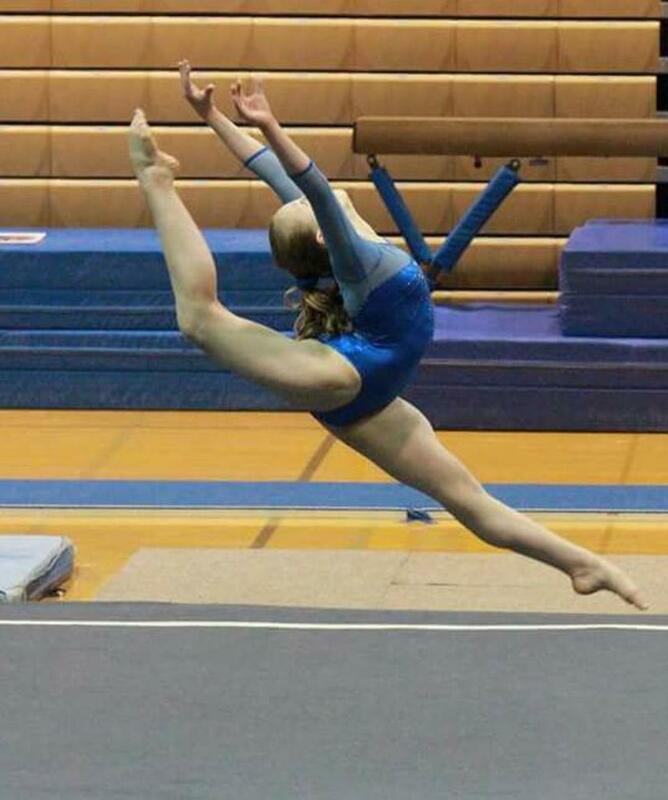 To be placed on one of our girls’ JO competitive gymnastics teams, your child must be evaluated by our coaching staff. To schedule an evaluation or to obtain additional information about Alpha Gymnastics Competitive Program, please contact us. The Xcel Program is a national USA Gymnastics program designed to offer a fun and affordable competitive experience outside the traditional (USAG) Jr. Olympic Program. It is open to a variety of ages, abilities, and commitment levels, and is perfect for those who want to enjoy the benefits that gymnastics has to offer while having more flexibility than the Jr. Olympic program. The Xcel program is ideal for not only entry-level gymnasts, but also older gymnasts that are looking for a fun way to stay in shape and be involved in the sport. They want to continue to participate in other sports or activities and cannot be in the gym for the number of hours that the Jr. Olympic program requires. They have a passion for the sport of gymnastics, but do not have the desire of being a Level 10 or elite gymnast. There are five divisions in the Xcel program: Bronze, Silver, Gold, Platinum, and Diamond. Each division has required skills for each routine. The Alpha Men’s Program is dedicated to developing international elite gymnasts. Our objectives are to identify and develop gymnasts through the high-performance pathway with athletes coming from across the state of Washington for intensive training under an expert team of coaches anywhere from 4 - 30 hours per week. 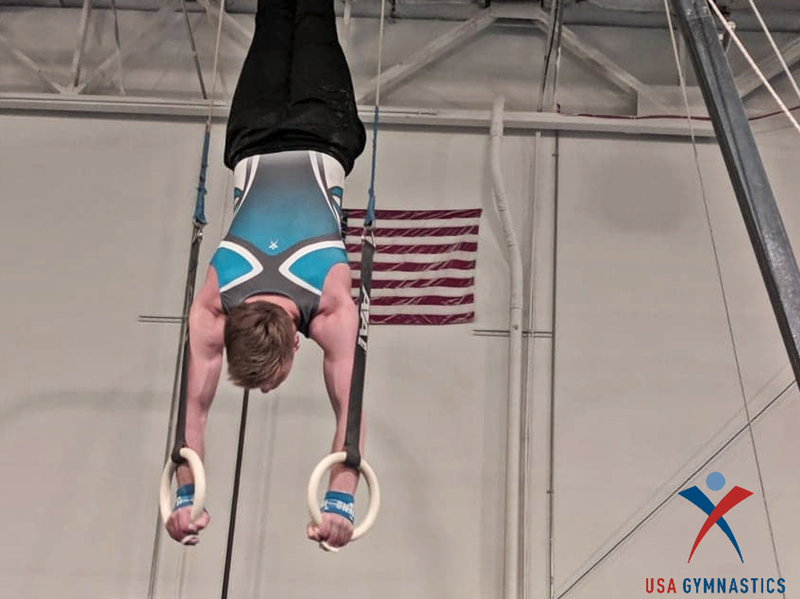 The Men’s Gymnastics Team offers a program catered towards every phase of an athlete’s development from Junior Olympic Developmental Squads, Junior Elite Development as well as the Senior Squad Program. Assessments can be requested by coaches, families or athletes directly. If a placement is offered within the program all athletes train at our 12,000 sq. foot state of the art facility.